It has been a long time since I last used a sulfate free, non-lathering shampoo. As much as I try to love non-lathering shampoos, I just haven't found one that I like enough. I have dry hair but my scalp tends to produce a lot of oil and build up, so I turn to lathering shampoos to get rid of the problem. Not to mention, I love it when my scalp feels squeaky clean. It's so refreshing. Unfortunately, most lathering shampoos often strip hair of moisture and color (if hair is color treated). A few months ago I was offered the opportunity to try Beverly Hills celebrity hairstylist Nelson J's Argan Oil 7 Non-Foaming Shampoo ($22). Given my feelings towards non-lathering shampoos, I decided to give this product a try anyways because believe it or not, I really do want to find a non-lathering shampoo that I like, and I thought that this possibly could be it. But was it? The Argan Oil 7 Non-Foaming Shampoo is certainly different from others I have tried in the past. For starters, it can literally replace your other hair care essentials, which I think is kinda cool. This product is not just a shampoo, it's also a conditioner, detangler, color protector, smoothing serum, styling lotion, and it also helps give locks a shine boost thanks to the Argan. This shampoo contains a lingering peppermint citrus fragrance which is pretty nice, but based on personal preference I'd much rather have a fruitier/warmer scent when it comes to my shampoos. If you happen to be a fan of minty notes though, I am sure the fragrance of this shampoo will be to your liking. This shampoo is very creamy in consistency, and I was surprised to see that inside the creamy formula were small, round green beads. I am not exactly sure what the purpose of the green beads are-if there is one. Anyway, when I first used the shampoo, I figured that the green beads would dissolve after working the shampoo into the hair, but that wasn't the case. The beads remained their solid selves all throughout cleansing. I do find the beads a little odd to work with, but I like that they are easy to rinse out of the hair. For my thick, shoulder length hair I find that I need quite a bit of shampoo to completely coat my hair with product. Once I start working the shampoo into my hair, instead of a lather, a silkier texture comes into play. When I massage the shampoo into my scalp I do feel a slight refreshment, but it's not enough to the point where I feel like my scalp is squeaky clean. After I have applied the shampoo all over my hair, I then brush through the hair with a wide-tooth comb to help evenly distribute the product a little more. I must say, I was really impressed at how simple it was to detangle my tangle prone hair. Hardly any effort went into it, at all. When I rinse the shampoo out of my hair, my strands don't feel stiff and straw-like, which is great. My hair really does feel more moisturized. And after I style my hair, I do notice a difference. My tresses feel softer, and they look a bit more healthier, and shinier. I like this shampoo, but I don't feel like it completely removes all the oil and build-up on my scalp so, I have been using this in conjunction with my usual lathering shampoo. First, I cleanse my scalp area with my lathering shampoo. Then after I have rinsed out the shampoo from my scalp, I apply the Argan Oil 7 Non-Foaming Shampoo on the mid-shaft and ends of hair, which are the sections that tend to be driest. Overall: If you are a fan of sulfate free, non-lathering shampoos, Nelson J's Argan Oil 7 Non-Foaming Shampoo is one that I really recommend. I think this shampoo will work for all hair types, but for those of you with drier hair, you may really enjoy this product because of it's healthy, moisturizing benefits. 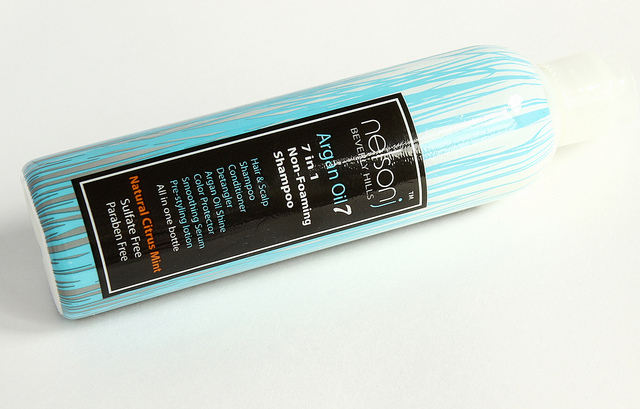 What do you all think of Nelson J's Argan Oil 7 Non-Foaming Shampoo? Which are your favorite sulfate free shampoos? Disclaimer: This post contains items sent from PR for review consideration. I am not being monetarily compensated for this review and as always, my opinions are honest, never influenced, and my own.